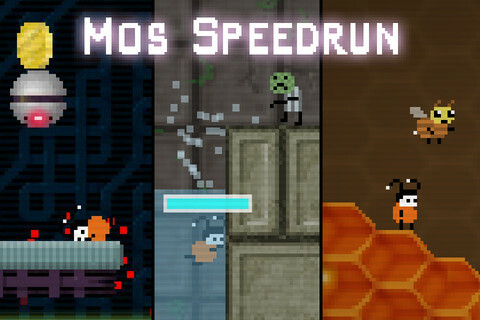 One of our favorite speedrun platformers has to be Physmo’s Mos Speedrun. The graphics, controls, physics, soundtrack, music, challenge and difficulty are all, for lack of a better word, perfect. Since it’s release back in April of 2011, Mos Speedrun has received 7 updates, adding more content, more enemies, more costumes, video recording and uploading to YouTube, and more, making it a prime contender for best Speedrun Platformer on the iOS, next to League of Evil. If you’ve yet to pick up Mos, didn’t have an iDevice back when it was released, or just missed out on it, it’s one game every platformer fan needs to own. Snagging the spolight for our third Review Rewind title, Mos Speedrun is still on our devices, and will never be taken off. It’s a great game that we’ll keep coming back to time and time again when we’re looking for a great platforming challenge. **Note: This review was written after playing Version 1.5. Running. When your pudgy like most adolescent kids these days the sound of that very word strikes fear into your little cheeseburger-loving heart. Fortunately for you this game encaptures the fun that isn’t running and wont make you sweat at all. 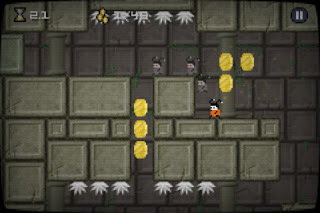 The gameplay is quite simple, your goal is to run to the goal in the fastest time possible while trying to be speedy around obstacles and enemies. Quick reflexes are the name of the game here but with time even the most pitifully uncoordinated player will be able to play like a pro. The first level is the of course the adjustment level where you get used to the controls and the nuances of the game. 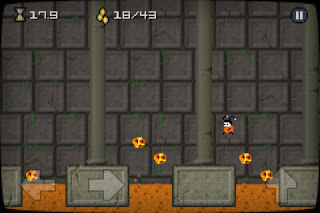 After that you are basically on your own to explore and finish all of the levels. Each level is unlocked once you complete the prior level regardless of whatever you scored on it. In each of the levels there are a variety of different paths that you can take some of which net you more or less coins that influence your endgame score. Through a process of trial and error you begin to figure out what works and what doesn’t and how you can begin to improve your time and score. The reason I am really enjoying this game is due to that factor of replayability. No matter how well I finish a level I am always intrigued enough to try it again and try to shave a few seconds off for bragging rights on the leaderboards. At the end of each level you score badges on the various things you did. For example if you found the hidden skull in each level you get a badge, you finish inside the time limit you get a badge as well. I usually don’t enjoy games that have a in-game timer but I’m okay with it in this orientation because speed is this games middle name and being able to see the amount of time your wasting trying to find the skull and increase your panic level. After you die in a level (which will happen often believe me) you are sent back to the start where you can watch as a ghost of your previous attempt runs alongside or ahead of your current effort to not die. You have the option to turn off the ghost respawning and the type of control you use in the blatantly obvious option menu. Another nifty feature in the option menu is the fact you can change your characters look from there. The costumes include a ninja, the atypical purple jogging suit, and a bee. 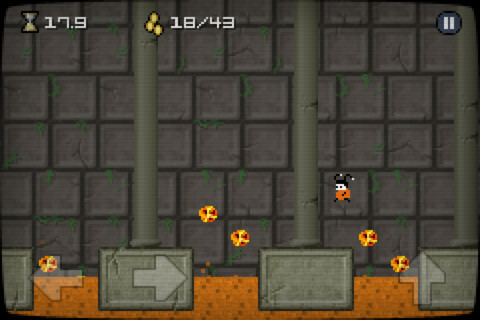 There are 5 worlds in all and to unlock the next one you need to earn a certain number of badges in the previous level. Overall this a extremely addicting game that has you shaving off the seconds in the pursuit of a better score to boast about. With tons of replayablility and hidden objects you will always find new content in Mos Speedrun. I give it a 5/5.